Real Health was created in Auckland in 2003 and is the conception of over 30 years of work within the Natural Healing Arts and a personal journey to find a vehicle to help and assist people with a desire to take responsibility for their own health and wellbeing away from the new world view of modern drug and surgery dependent medical care. 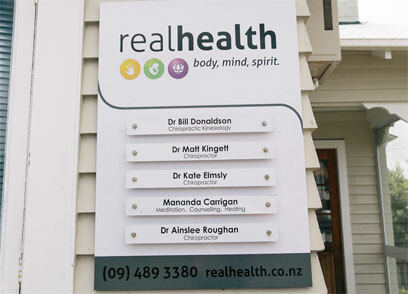 Real Health utilises the concepts of Chiropractic Spinal and Nervous System Care, the energetic or vibrational medicine techniques of Applied Kinesiology and Total Body Modification and the Mind & Spiritual techniques of Natural Healing and progressive counselling and coaching. Real Health offers a comprehensive range of tools, techniques and a professional healing environment that is both supportive and enlightening.